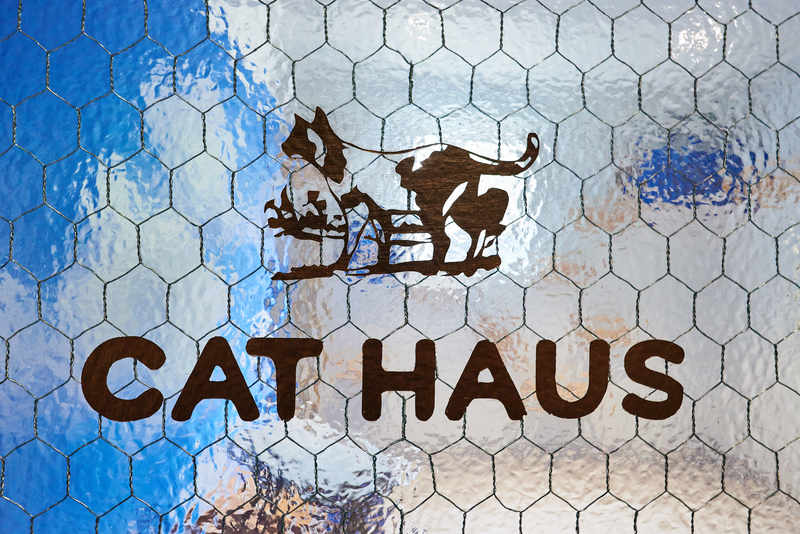 Welcome to Animal Haus Dog Daycare & Cat Boarding at Queen West Animal Hospital! 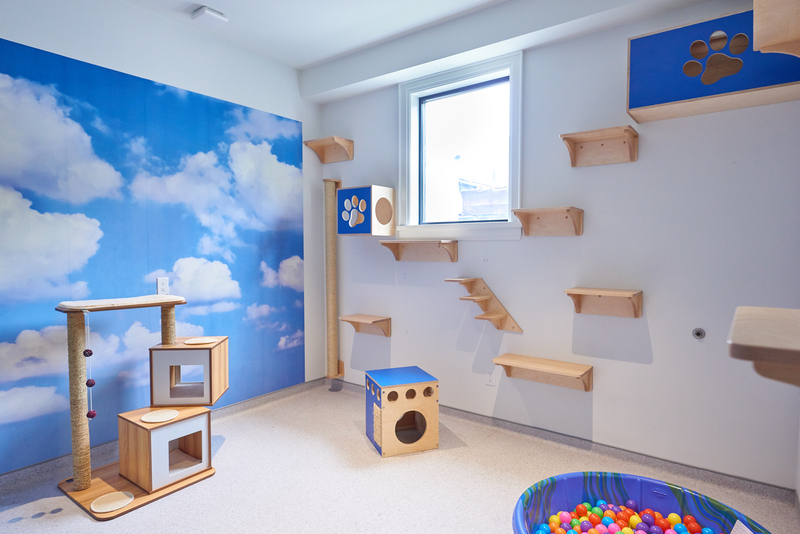 Designed with the Queen West dog and cat in mind, Animal Haus offers both open concept and suite living for dogs and expandable and connectable condo spaces for cats. To download the following documents prior to your daycare or boarding experience, please click and print. Thanks! 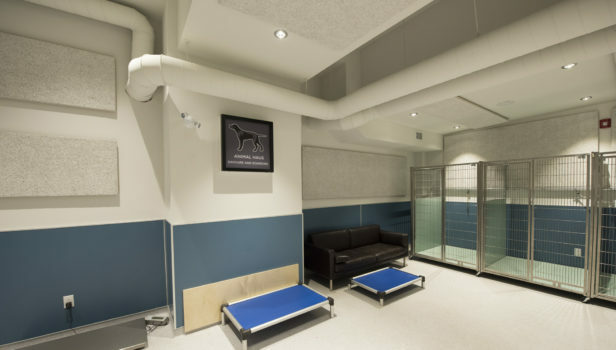 Animal Haus at Queen West Animal Hospital is a state-of-the-art dog daycare and cat overnight boarding facility in the heart of downtown Toronto. We love hanging out with your pets and are located just upstairs from NOW Magazine’s Best Animal Hospital of Toronto. 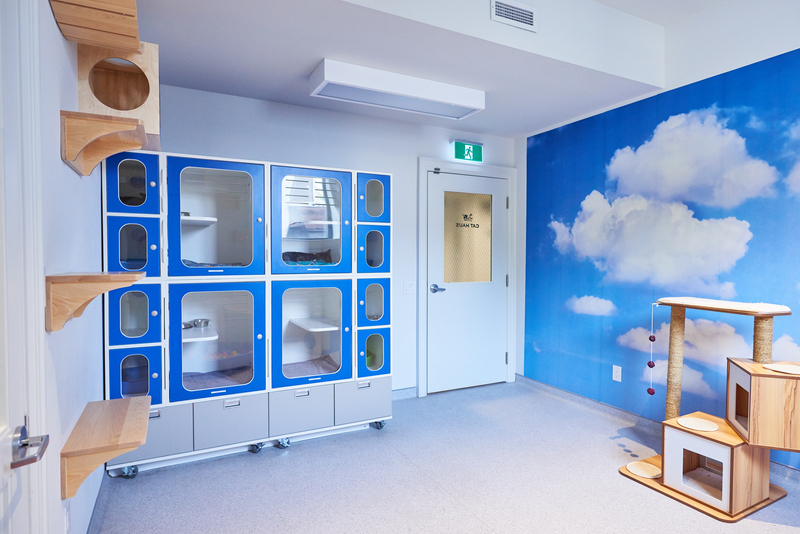 For dog owners, we offer both open-concept and suite-style boarding, with a large play space, included walks and an attached outdoor play space for doggy bathroom breaks. For cat owners, we offer single and shared condos as well as a communal play area where cats can take turns stretching their legs. Come by and ask for a tour! We’d love to show you around. We strive to provide every dog and cat with a home away from home experience during his or her stay with us. 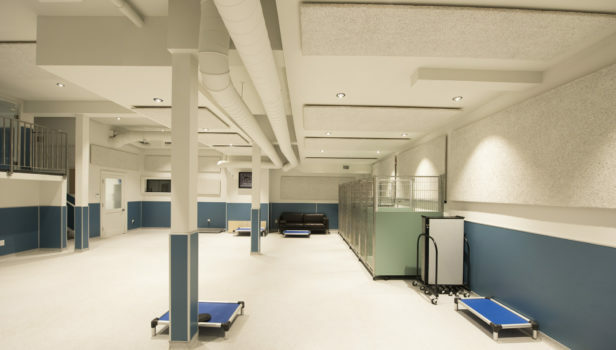 We are committed to providing a safe, clean, fun and enriched environment for every dog and cat during his or her stay. We consider your pets as equal members of your family, just as they are to us. Plenty of space to run and play! Classical music playing throughout the day which has been scientifically proven to reduce stress and anxiety. Staff on site weekdays during business hours and for several hours on weekend days. Eight brand new cat condos available with flexible condo-sharing options. Between 7:00AM-7:30PM. Although boarding clients should try not to drop off their pets during our daily dog walking times (10-11AM, 2-3PM) as it may take longer for boarding pets to be admitted during those times. Please book with us over the phone or through email. Please use the buzzer to the left of the Strachan door to call boarding staff. 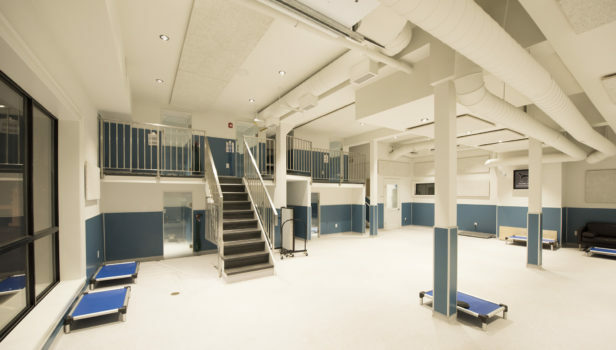 Can I take a tour of the facility before I book? Absolutely! Please book an appointment for a tour and meet and greet (with dogs) through email or phone. What is required to book dog daycare and cat boarding? For current dog clients of Queen West Animal Hospital, we would need you to fill out forms and to book a Meet and Greet appointment. For dogs who are not QWAH clients we would need you to fill out forms and to have your regular veterinarian send us proof of up to date vaccinations. With all of the above information submitted we can then book an appointment for a Meet and Greet. This brief get to know each other meeting lasts approximately twenty minutes and is designed to get to know your dog as well as determine if they are suited for daycare or boarding at Animal Haus. Please remember to bring your dog with you! For dogs who have never been to Animal Haus before, we sometimes recommend either a 2 hour complimentary trial visit, or a ½ day (up to 6 hours) to ensure we’re the right fit for your pup. Will you be able to administer medications for my pet during their stay? Our skilled staff are more than able to administer all medications to Animal Haus guests! There is a small daily fee to administer any prescription medications and any supplements that are given in a pill form (supplements that are added to regular meals can be handled at no extra charge). Are there discounts if I have multiple pets? How far in advance should I book my stay? We recommend 1-2 weeks in advance for boarding, 3-4 days in advance for daycare. The earlier the better to ensure your stay at Animal Haus. Who provides food for my pets stay? We ask each owner to provide food for their pets stay to avoid unwanted gastrointestinal issues. What happens if I forget my pets’ food for their stay? If you forget their food or didn’t bring enough, we provide food at an affordable daily rate. We will happily feed your dog anything of your choosing, including foods that must be kept in the refrigerator or freezer. Can I bring personal items for my pets’ stay? Dogs staying in a suite may have blankets and beds from home to make them feel more comfortable. When they are in open concept, dogs are happy to have the company of other dogs and staff members. Please bring a small bed, blanket or an article of clothing to make your cat feel more at home when they are staying with us. All dogs and cats must be spayed and neutered after the age of 6 months old and be up-to-date on vaccinations. Does my pet have to be on flea and tick preventative? We require all dogs be on vet prescribed flea preventative regardless of the time of year if they’re coming to daycare. Dogs must also be on a vet prescribed tick preventative from May 1st-November 30th. We require all cats be on flea preventative from May 1st-November 1st. How often do dogs get to go outside? Daycare dogs receive 2 group walks per day. All dogs at our facility have unlimited access to our outdoor area for as many bathroom breaks as required. Do you offer drop-offs and pick-ups? We apologize, at this time, we’re unable to offer mobile drop-offs or pick-ups. How old do puppies have to be for daycare or boarding at the Animal Haus? What kinds of treats do you use with dogs in Animal Haus? For our regular treats we use a Gastro kibble that is specially formulated to be easy enough on the stomach to avoid any upset. We also occasionally use beef liver treats for more “high value” situations. For dogs with allergies we have a hypo-allergenic kibble.